Elgin City Hall is located at 150 Dexter Court, Elgin, IL 60120; phone: 847-931-5590. Photo: Ora Pelton House, ca. 1889, 214 South State Street, Elgin, IL. Listed on the National Register of Historic Places in 1982. Photographed by User:G LeTourneau (own work), 2007, [cc-by-3.0 (creativecommons.org/licenses/by/3.0)], via Wikimedia Commons, accessed June, 2014. In 1835, Hezekiah and James Gifford staked claims along the east bank of the Fox River. They named the new settlement "Elgin." Soon the Giffords were joined by members of the Kimballs and other pioneering families, and the settlement began to grow. The original town plat was recorded by James Gifford in 1842. The town benefited from the development of a major east-west stage coach and postal route between Chicago and Galena. By 1854, the population of Elgin approached 2000. The citizens voted to incorporate and on February 28, 1854, the Governor signed legislation chartering the City of Elgin. The coming of the railroad in 1850 spurred growth and development in the community. Elgin became a dairy center for the region. Elgin shipped train cars of milk to Chicago, and in the 1860's Gail Borden opened a condensed milk plant. Several other creameries and butter manufacturers joined Borden's Elgin Milk Condensing Company. In addition to the dairy industry, the coming of the Elgin National Watch Company had a major effect on the growth of the city in the late 19th century. The company founded its operations in Elgin in 1866 and produced its first watch in 1867. The company was the largest producer of watches in America and became the largest watch factory in the world. From the 1860's to the 1890's, the growth of employment in the watch factory more than doubled as did the population of Elgin. By 1890, Elgin's population had grown to 17,823 residents. By the early 20th century, Elgin was a prosperous community with a wide variety of businesses and industry. 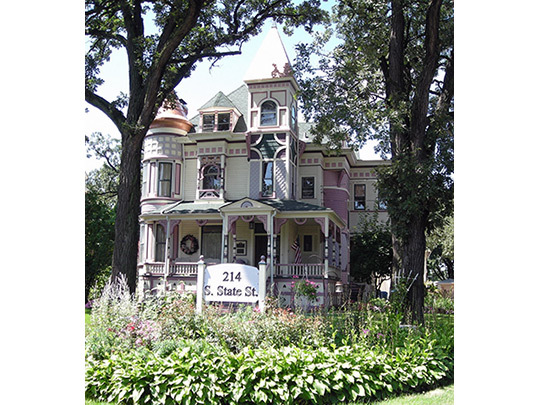 This prosperity was reflected in the many fine homes and neighborhoods built during these years, and in the rapid expansion of Elgin on both sides of the Fox River. In addition, downtown Elgin was the retail and entertainment draw for miles around. City of Elgin, Comprehensive Plan & Design Guidelines: A Brief History of Elgin, Section 1, Page1, 2005, il-elgin2.civicplus.com, accessed April, 2012.